Jose T. Alvarado, 85, passed away Aug. 17, 2018 at home surrounded by loved ones. He was born June 12, 1933 in Greeley, CO to migrant workers Abran and Andrea Alvarado. At the time of his birth he had 2 sisters, Julia and Esther and 2 brothers, Ruben and Florencio. The family moved to Pueblo, CO when he was about 2. Two more brothers, John and Richard, and a sister Roberta joined the family after him. He was 8 when his mother died in childbirth and he went to live with his sister and brother-in-law Julia and Mateo Jimenez who raised him. Jose graduated from Central High School and received an associate degree from Pueblo Junior College. He served 2 years in the US Army and was a Korean War Veteran. He began working at C&W Railroad after high school and then CF&I after he returned from serving his country. He started his career at CF&I as a coremaker in the casting foundry, completed the apprentice program and transferred to the continuous caster department. He retired in 1984. 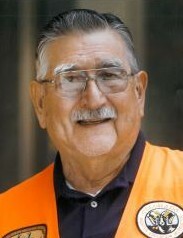 Jose was an avid hunter and outdoorsman and turned that passion into teaching individuals hunter safety for 51 years and Boy Scouts for 35 years. He was an advanced master hunter education instructor, and was proud to say he educated 16,000 plus individuals. He was assisted by longtime friend and hunter education team- teacher, Paul McWhorter. He helped translate hunter education manuals into Spanish and traveled to LaVeta, Walsenburg, Wetmore, Glenwood Springs and Aspen to teach classes in Spanish. He was a Boy Scout scoutmaster for 35 years for Troop 16 at St. Joseph Church and Troop 18 at St. Leander Church. Jose received one of the highest national awards, the Silver Beaver. It is given to those who implement the Scouting program and perform community service through hard work, self-sacrifice, dedication, and many years of service. It is given to those who do not seek it. He was a lifetime member of the Knights of Columbus Council #4286 and a 4th Degree member of Assembly #90. He enjoyed volunteering at the Pueblo Community Soup Kitchen once a month serving breakfast and lunch. Participated in the annual fundraising walk, and would be among the top fundraisers. He became a member of St. Leander Catholic Church when he and Violet were married 62 years ago. Together they raised 4 children; Gloria, Jose, Gerald and Lisa. The rest of the family includes grandchildren Gabe, Josh, Jason, Ryan, Nicholas, Jerrad, and Valerie; and great-grandchildren Harper, Kindred, Rowan, Keltyn, Bayleigh, and Ava. Whether you know him as Chief, Trini, Joe, Dad, Jose, Grandpa, Pa or Mr. Alvarado he was the volunteer extraordinaire; always there to help and never expected anything in return, always taking charge because he knew best.